So, here's a fabulous idea - scoop up some of those luxe beach towels that are deeply discounted this time of year and . . . get them monogrammed! It will be worth it to store them until next season, or give them as Christmas/Hanukkah gifts, birthday gifts - or, if you live in Florida like us, use them all year long. 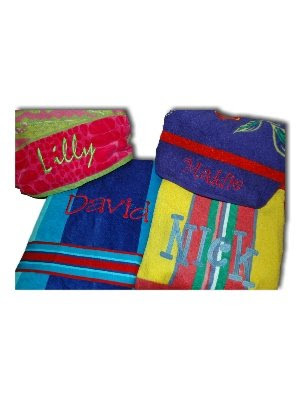 Beach towels make a nice personal gift that people genuinely like to receive! Just a hint! Check out these cute ones Nikki picked up at Dillards - she did some for gifts and some for her little darlings - now that's one smart Chicky! How cute with the rhyme! !